But I want to focus on a single scene, a single pair of words. Jellico becomes increasingly disappointed with his first officer, Riker, someone who has long worked well with Picard. Each new conflict with Jellico seems to point out just how well Riker’s and Picard’s leadership styles are (were?) complimentary. The conflicts escalate and then, the very trait that Picard used to single out Riker as his first officer2 causes Jellico to relieve Riker of duty, effectively firing him. The scene is Riker’s quarters, he’s off-duty, reading a book, when Jellico enters in need of the best shuttle pilot he can get. 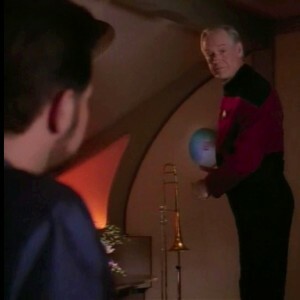 He sees Riker’s trombone and asks “Classical?” to which Riker responds “Jazz.” Jellico’s response (“Ahh”) might be an indication that he finally “gets it”–one of the major differences between their two styles. Classical, with a written musical score, scripted by a composer and directed by a conductor. It’s pretty clear Jellico sees himself in both roles on this ship. In a simplistic sense, if the musicians know their parts, any conductor can come in and take charge. That’s how Jellico seems to like it. Jazz, with a given melody and someone to set the beat, where the different musicians take turns improvising on the melody. It’s pretty clear that Jellico isn’t willing to give up that much control. It’s also pretty clear that Riker prefers this style. Someone to set the tempo and the melody (i.e., the Captain), while each talented performer is permitted to interpret and extemporize under that (limited) direction. It’s a High Relationship / Low Task leadership style and it’s most effective when the follower is able, willing and confident, words that most certainly do describe Will Riker (and the crew of the Enterprise). So there you have it: Classical and Jazz: two ways to make music. And two ways to captain a starship. Given the right situation, each can be effective. The trick is in matching the readiness of the follower to the appropriate leadership style. Readers, when do you employ these leadership styles? What does it look like when you gauge the follower incorrectly?